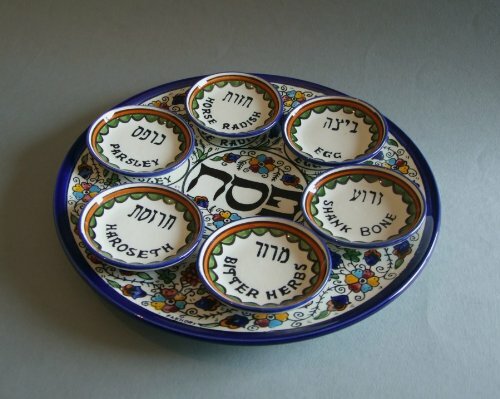 This colorfully designed ceramic plate provides places for parsley, horse radish, an egg, a shank bone, bitter herbs and haroseth - six of the traditional foods that are blessed on during the reading of the Passover Seder. This a special Passover plate that includes inscriptions in both English and Hebrew for the symbolic foods eaten during the Jewish Passover Seder. According to the traditional Jewish law (Halakha), the food should be arranged in the same order in which it will be used during the Passover Seder, with the first food to be blessed upon placed closest to the head of the table. This a special Passover plate and bowls set that includes inscriptions in both English and Hebrew for the symbolic foods eaten during the Jewish Passover Seder. According to the traditional Jewish law (Halakha), the food should be arranged in the same order in which it will be used during the Passover Seder, with the first food to be blessed upon placed closest to the head of the table. This colorfully designed ceramic plate provides places for parsley, horse radish, an egg, a shank bone, bitter herbs and haroseth - six of the traditional foods that are blessed on during the reading of the Passover Seder. If you have any questions about this product by Armenian, contact us by completing and submitting the form below. If you are looking for a specif part number, please include it with your message.